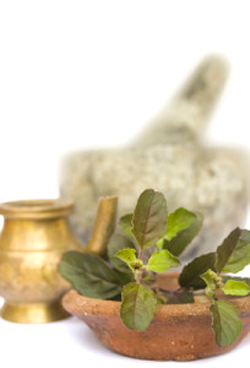 Five powerful Ayurvedic herbs for optimal health. Photo credit: Kate Towell's blog. This weekend I taught a class on Ayurveda herbal healing basics. What fun! Yogi Bhajan said, “If you want to learn something, read about it. If you want to understand something, write about it. If you want to master something, teach it.” I don’t know about mastering the subject, but I sure learned a lot from teaching the workshop. Herbalism, or the use of plants for healing and creating optimal health, has a long standing tradition in Ayurvedic medicine. In Ayurveda, herbs are used in healing and prevention, and the simplest ways to use herbs are either in cooking or infusing (teas). For example, Turmeric, known for its anti-inflammatory properties, can be used as a culinary spice to prevent disease and maintain good health. This makes Ayurveda herbal healing easy to incorporate into daily life and accessible to everyone. Ayurvedic herbs are used for many reasons: to maintain overall health; to boost immunity; support mental clarity; to calm the nerves; to improve digestion; to support the detoxification; to promote healing; and to rejuvenate all tissues in the body. The following are five of the most powerful and useful Ayurvedic herbs that are widely available in most health stores and from online retailers like Banyan Botanicals. Ashwagandha – One of the most highly regarded and commonly used adaptogens in the Ayurvedic herbal medicine. If you are feeling stressed out or your adrenals are fatigued Ashwagandha is the herb for you. It maximizes the body’s ability to resist stress and enables the body to sustain vital energy throughout the day while promoting sound, restful sleep at night. This powerful herb is used to promote muscle strength and supports joint health. It is also used to maintain a healthy libido (usually given to men), and is said to bestow upon its user the vitality and strength of a horse. Neem – Neem is one of the herbs I use daily and is one of the most powerful detoxifiers and blood purifiers used in Ayurveda herbal healing. It has traditionally been used to purify the blood, cleanse the liver and support the immune system. It is also commonly used to support healthy skin and to maintain healthy blood glucose levels. Turmeric – One of Ayurveda’s true treasures. It is an excellent antibiotic, strengthens digestion and is powerful in reducing inflammation. In recent years turmeric has been in the news and research has been done on its main component curcumin. Curcumin has been shown to provide many diverse health benefits, including preservation of brain function, high antioxidant properties, regulation of inflammation and cancer prevention. Triphala – A beautiful balancing formula for detoxification and rejuvenation it is not one plant, but three. The Sanskrit word actually means “three fruits” – one fruit to balance each of the three dohsas (vata, pitta and kapha). Triphala is recommended and used more than any other Ayurvedic herbal formulation. Popular for its unique ability to gently cleanse and detoxify the system while simultaneously replenishing and nourishing it, this traditional formula supports the proper functions of the digestive, circulatory, respiratory systems. It is commonly taken as a daily supplement to help maintain balance all of the doshas but especially for vata imbalances such as constipation. Tulsi or Holy Basil – This plant is considered sacred by many people in India and can be found growing in temple gardens where the rich fragrance opens respiratory passages and some say, helps the spirit soar. It removes excess congestion (kapha) from the lungs and upper respiratory tract promoting clear, comfortable breathing. Tulsi promotes healthy circulation and supports proper function of the heart. It strengthens digestion and supports healthy weight management. It also boosts the immune system and is useful for maintaining a normal body temperature. Tulsi promotes mental clarity, opens the heart and bestows the energy of love and devotion.